Hemingway's The Sun Also Rises tells the story of a number of American and British individuals traveling from Paris to Spain to watch the infamous bullfights and the running of the bulls in Pamplona. This is a topic suggestion on Ernest Hemingway's The Sun Also Rises from Paper Masters. Use this topic or order a custom research paper, written exactly how you need it to be. As one of the most profound pieces of literature by Ernest Hemingway, The Sun Also Rises tells the story of a number of American and British individuals traveling from Paris to Spain to watch the infamous bullfights and the running of the bulls in Pamplona. Hemingway is able to expertly tell the story of several members of the “lost generation” at this point in history because he himself was one of them. Having seen the horrors of the First World War, Hemingway was fundamentally altered, and his writing reflects this sentiment expertly. The protagonist of this novel, Jake Barnes, was wounded in conflict; he is impotent as a result. This crisis of manhood is something that plagues him throughout the course of the novel, especially as a result of the deep emotions he feels for another character, Lady Brett Ashley. If Barnes is able to embody the character of the first two decades of the 1900s—that of lost masculinity and incompleteness as a result of the war—then Ashley is able to embody the character of the 1920s, the time when the novel is set; she is a “new woman”, with short, bobbed hair and a growing sense of freedom, both social and sexual. At the close of the novel, Barnes and Ashley reunite in a taxi, reminiscing about what “might have been”—the common thread between the world of Hemingway’s novel, and the world in which he himself lived. 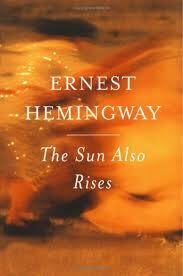 Boxing in The Sun Also Rises is a symbolic theme to be examined in Ernest Hemingway Research Papers. The Sun Also Rises Symbols research papers discuss the the symbols of water and bullfighting in Hemingway's novel The Sun Also Rises. The Sun Also Rises Themes - Use this topic or order a custom research paper, written exactly how you need it to be. Frederic Henry in A Farewell to Arms - Frederic Henry of A Farewell to Arms research papers explore the main character of Ernest Hemingway's classic novel. For Whom the Bell Tolls by Ernest Hemingway - For Whom the Bell Tolls Ernest Hemingway essay examine the novel by American writer Ernest Hemingway. Symbolism in Catcher in the Rye - As a quintessential piece of American literature, Catcher in the Rye has been studied time and time again, looking at themes, setting, characterization, and, most importantly, symbolism. Literary Meaning - Faulkner's contemporary, Ernest Hemingway was a far less complex writer, but his works, including The Sun Also Rises, are still replete with literary meaning. F. Scott Fitzgerald and Ernest Hemingway research paper delves into not only the comparison of these two authors but two pieces of work specifically done by each author. Hemingway Stories research papers on his short stories and novels. This is a research paper topic suggestion to the compare the protagonists in Hemingway's Stories. Green Hills of Africa - Another story that relates very directly to Hemingway's life is that of Green Hills of Africa. Symbolism Snows of Kilimanjaro - Hemingway used a vast amount of symbolism in The Snows of Kilimanjaro. Learn about the specific symbols in a research paper on the novel. Soldier's Home research papers tell that Hemingway thought it was his best story. Character Analysis in Old Man Sea - The main character of The Old Man and the Sea, Santiago, is a mature version of the typical Hemingway hero. The Snows of Kilimanjaro essays are custom written on Hemingway's short story. Themes in Farewell to Arms - Paper Masters understands the classic Hemingway story and can help you write a research paper on its themes. A Farewell to Arms - Ernest Hemingway, research papers provide answers and questions to whether A Farewell to Arms is a "study of doom" as it has sometimes been called. Paper Masters writes custom research papers on Hemingway the Sun Also Rises and discusses one of Hemingway's most profound novels about American and British individuals traveling from Paris to Spain.